Retractable Vinyl Window Panels allow you to instantly enclose virtually any opening with an impenetrable barrier against wind, inclement weather and winter. 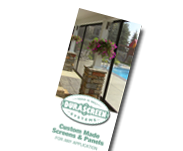 Each panel is made with our patented self sealing design along with super durable vinyl panels — hand crafted to your exact specs — with or without windows. Vinyl panels are often chose for screen porches and lanais during cold and blustery weather so that the area can be easily heated. Restaurants often use our retractable vinyl window panels in conjunction with fixed window panel screens to extend the use of outdoor dining areas and protecting guests. Check out our gallery and see the possibilities.